Irish-American electrical engineer who made innovations in analytic methods in electronics, and co-discovered the radio reflecting properties of the ionosphere in the upper atmosphere. 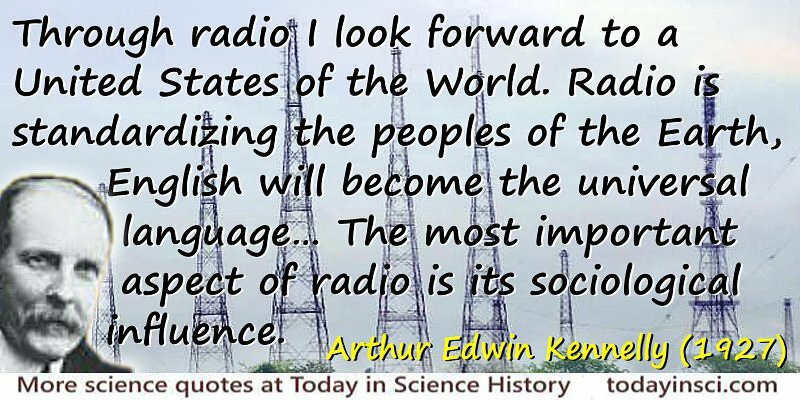 As quoted in Orrin Elmer Dunlap, Radio's 100 Men of Science. Together with Oliver Heaviside, Kennelly shares recognition for describing the role of an atmospheric layer in the Earth's ionosphere in bouncing a radio signal over the horizon, instead of the signal merely travelling in a straight line from the transmitter and disappearing out into space. This enormously useful property of the Kennelly-Heaviside layer made shortwave radio communication possible between places remote on the curvature of the earth for which no line-of-sight path was otherwise possible. 1 A.E. Kennelly, 'Scientific Research in the Engineering Schools', Electrical World (1920), 75, 150. Science Quotes by Arthur Edwin Kennelly. 17 Dec - short biography, births, deaths and events on date of Kennelly's birth. Arthur Kennelly, Electrical Engineer - Biography.